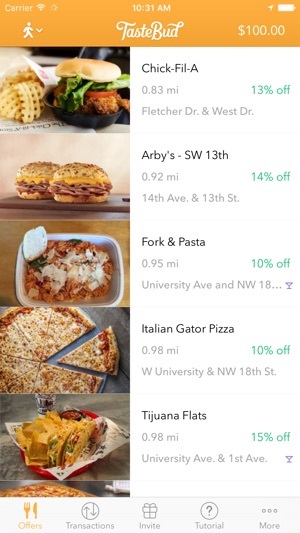 TasteBud is an app that lets you save up to 50% off meals at off-campus restaurants. Discounts change throughout the day, so be on the lookout for steeper discounts during off-peak/happy hours! Once you link a VISA card to the app, you can lock in a discount. Go eat! 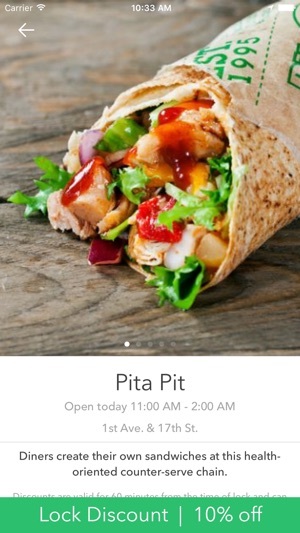 No need for awkward coupons or QR codes to scan. 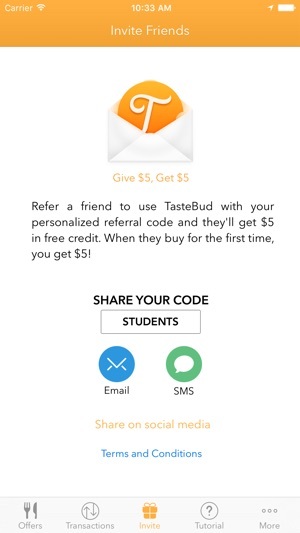 You don't need to ask the restaurant for the discounts as TasteBud will take care of it for you. Buy normally with your linked card and TasteBud will refund the discount directly to your card. Make sure Push Notification is enabled so you can see that your discount is being processed. It takes ~5 days for the cash to appear on your statement. 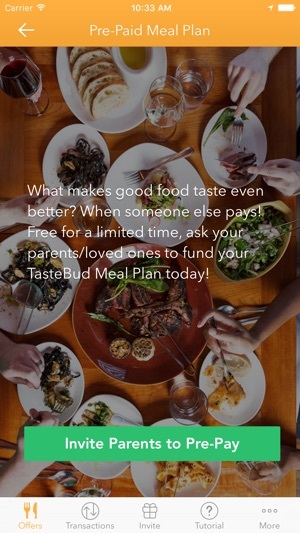 We hope you enjoy TasteBud, and write us at feedback@trytastebud.com if you have any questions! I have been trying to get in contact with Tastebud for weeks now. I locked in a 50% off deal at Z’tejas, used the card associated with my account, but was NEVER refunded. I am unsure why this happened. I would not have spent as much at the restaurant if I knew I was going to pay full price. There is no contact number available anywhere. I would not recommend trusting a company like this. Core app is awesome and their staff go above and beyond in offering a solid customer experience. Would strongly recommend Tastebud to anybody, they are the clear leaders in this category. © Copyright Azul Mobile Inc., all rights reserved.